I could sit and stare at fabric samples all day. Once I start looking, I can't stop putting patterns together! It's been a while since I've perused fabrics online, so I spent some time lately and found some new patterns I hadn't seen yet. I couldn't resist mixing and matching some combos! Freshening up your space with fabric is one of the easiest and most dramatic ways to get a new look, whether it be with pillows, a new table runner, re-covering an old stool, covering the back of a bulletin board or shelf, or switching out your drapes. 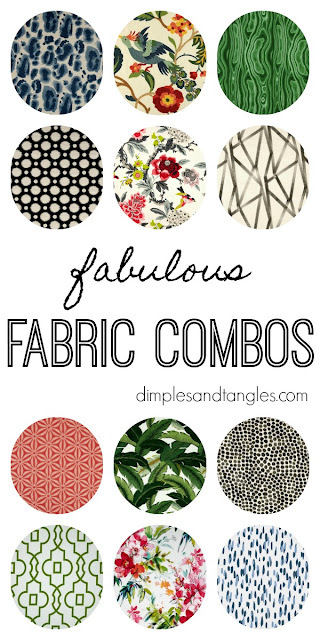 Here are some fabric combos I liked if you're ready for a new look! This bird floral is one of my long time favorites. I've had pillows from it in the past, and it's currently made into gorgeous panels on the windows at my parents' house. I'm DYING to use this flocked velvet fabric in the center somewhere, I've loved it since the moment I saw it! What do you think? Any new favorites? Gosh, this is such a talent! I love some of these combos, especially the orange and navy ones. They look great together, but you have to have a real eye for mixing patterns-or else it could end up kinda crazy. I definitely don't hold back when it comes to mixing patterns! A solid could definitely replace any of the prints in these combos and look just as great! I couldn't survive without mixing colors and patterns. And I love just about any print with birds. I have one bird print fabric that will soon be drapes in my living room. I also have another bird print fabric that I have no idea what I'm going to do with it but I couldn't leave the store without it. Maybe I'll save it for the day I get ready to re-decorate a room. I love bright colors so I love all the fabric choices you posted. Keep up the "bright" work. Yours was one of the first blogs that made me "stop in my tracks" when I saw your combo of bright colors and patterns mixed. It took my eye a while to see the beauty of that I'll admit but now I love it. I so badly want to do this but first I have to get a solid couch as the one I have is a floral. I'd love it if you would do a post on prints that work on a floral couch! Love your combos. 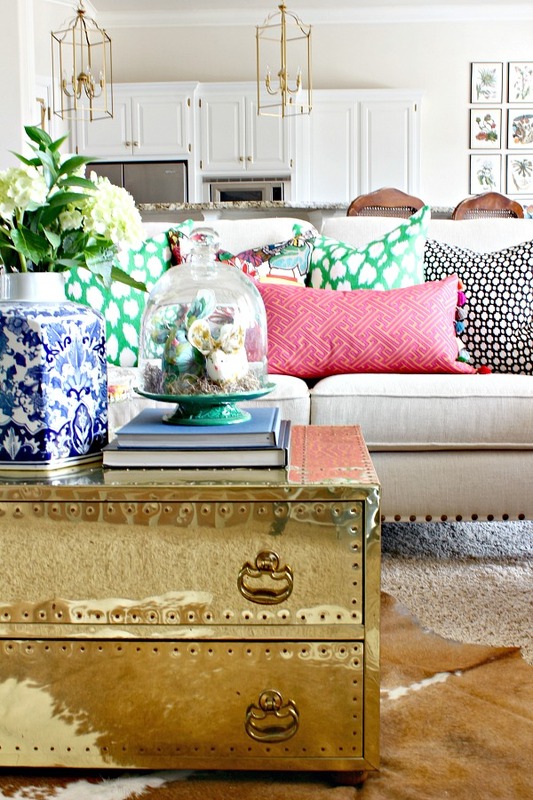 I love, love how you mix patterns and colors! Always beautiful! I hadn't seen that watercolor floral before. Very intriguing. (Here I go again, swooning over large-scale, colorful florals!) You're talented at pattern mixing, Jennifer, and in a sea of neutral homes or boho homes, I enjoy looking at your colorful, new trad decor. I just received my order from Fabric.com yesterday...I'm going to mix the Blue Dot (Mill Reef Indigo) with the Green Malachite. The are so pretty! The background on the dot pattern is not a bright white but not a quite a cream...I'm going to use it with my white duvet even though it isn't a exact match on the whites. With all the other color in front of it I don't think it will be noticeable. I want to order a Hot House (white) knock off pillow from that Etsy shop you posted about a while back. I think those 3 patterns will work! Thanks for the great post...I feel validated in my choices- I poured over the computer monitor for hours before I decided! Now to get to the sewing machine! THIS is exactly what hooked me when I first stumbled upon your blog - your ability and confidence to pull together fabrics, patterns and colors. Gorgeous - always. Any chance you'd offer your services (virtually) to pull some fabrics together in my home? I would love some help!